As a foundation, you aim at leveraging your philanthropic assets to achieve high social impact, through grant programmes or social investment aligned to your impact strategy. We can support you optimise your impact management, from refinement of your impact strategy to your data management and reporting practices. 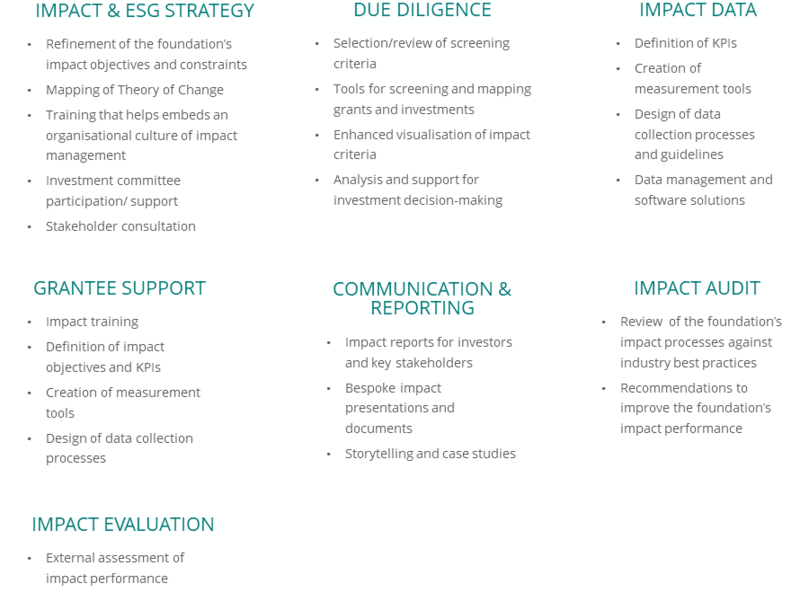 We also provide external evaluations of impact performance, as well as independent impact audits of the foundation’s processes so as to ensure consistency of approach across your portfolio and meet best practice. Our approach is based on our best practice publication The Good Investor and international standards such as the Impact Management Project, whilst also incorporating the Sustainable Development Goals. Fundamental to IFG’s impact approach is that it should be of greatest use to the organisation itself. Therefore, we focus on the practical adoption of new tools and systems, underpinned by guidelines, training and ongoing support. The result is that investment decisions can be made rationally, effectively and aligned with social value. Flexibility is also core to our approach as we ensure we understand our clients’ needs and culture so as to design the best approach for them. Impact Ventures UK (IVUK) is a social investment fund focused on supporting social enterprises working with disadvantaged communities in the UK. IVUK’s methodology to assess potential investment opportunities has been evolving since the creation of the fund in 2012.